Oh, Annabelle! Not only is this a totally gorgeous card, but you have the sweetest child too--great picture and design! I think this is one of the cutest uses for a glassine bag ever! Thanks for sharing, this is a wonderful idea. Anabelle - WOW! Just cute details everywhere especially the embossing on that envelope. OMG.....this is gorgeous. What a great idea! I will lift this one. The picture is too cute. THis is just so lovely... love the idea with the glassine bags! Quick and easy way to hold anything in on a project. but everything you did here is just gorgeous! 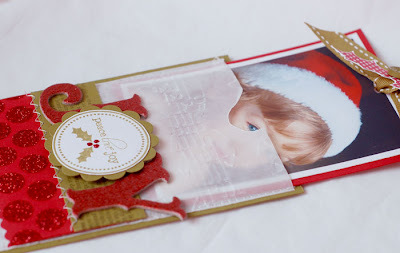 A gorgeous idea for those special family cards at Christmas. Definitely one to copy - thanks Annabelle! This is fabulous! Thanks for sharing. I just got an order with the glassine bags and will have to come up with something!! Aaawww this is so cute! I love the way your picture comes out of the glassine gag! I love this idea! Hey, I am ready for your HOLIDAY background for your Christmas posting on your blog! LOOOOVVEE this card!! So clever to put the picture in the glassine bag too! Absolutely beautiful!!! Wow, any recipient would be thrilled to receive such a gorgeous treasure! Nice work!! What an adorable card - I really like the way you have done the pull out and the way you have used the embossing folder on the bag. I'm sure any relatives would love to receive this card. Super creative and just beyond adorable!!! 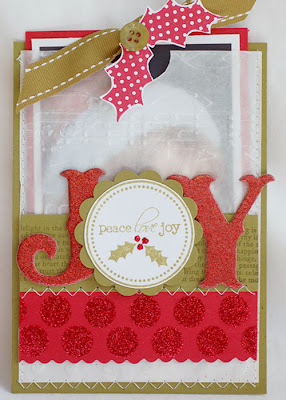 This is a beautiful card, and a great use for the glassine bags and a card that include a photo. Thanks so much for sharing! Oh gosh this is absolutely adorable! I love every little aspect of this! Thanks for the inspiration! this is FABULOUS!!!! love it! SO very clever! I love any project that uses glassine bags! Thanks for sharing, and have a great day! This is a beautiful project! Terrific idea with the glassine bags. I love card. it is fabulous and love that photo! Gorgeous, Anabelle!! 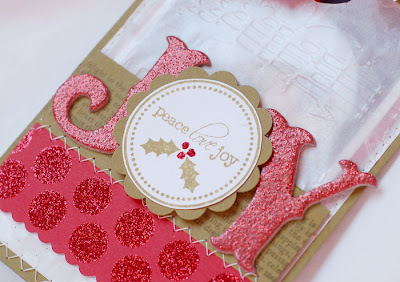 Love the idea of embossing the glassine envelope!! Such a creative card and way to send a holiday photo! Really nice card, a very different idea and I love all the different techniques. This is just beautiful, and such a clever idea! KEEEEUTE! I'M LOVIN' THIS! I really like the glassine too, it is perfect. 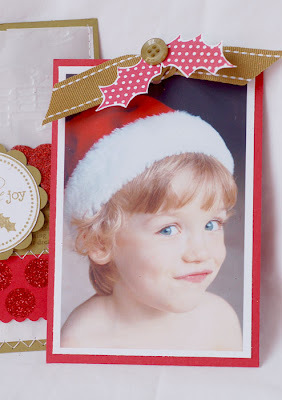 I like this idea...I have a cute little girl (ok and boys too) I could make a Christmas picture of and do this. Love it! Beautiful, beautiful card and photo. TFS. Anabelle, I love this project of yours sooooooo much! It's so pretty! The colors and the glitter have me swooning! Thank you so much for sharing with us! I love the design of this card! So cute and that picture of your child is A-MAAAAAAAZING! I really love the idea of making a pocket with the glassine bags--great job!